This article was published in Good Bird Magazine in spring of 2006.This is a great place to start to get an understanding of how to address this common behavior problem. If you want a more in depth look at this problem, I also offer a recorded version of one of my webinars Addressing Screaming for Attention in Companion Parrots. To purchase a recorded version of for $19.95 visit this link . To see if I have any live webinars coming up, visit my calendar page. In any case, dont give up! This is a very fixable problem. “Screaming. Somebody reinforced the heck out of that behavior.” I said to myself. Misty, a double yellow headed Amazon parrot, lived with me for only a few weeks. She was there so that I could put some of her vocal behaviors on cue. However it quickly became apparent she had a few other behaviors that needed to be addressed first. Before her stay with me she resided with Jill Bell for six years. Prior to that time her history is pretty fuzzy. She is estimated to be 19 years old. This meant screaming could have been reinforced for at least 13 years. It must have been, because it was STRONG. Misty was relentless. I’d leave the room; she’d scream and scream and scream. She had been a good reminder of what companion parrot owners experience when faced with a very annoying and challenging problem. It can be very frustrating. Oddly enough, when I walk into someone else’s home and hear screaming birds I am usually not effected. But when a bird is screaming specifically, in what feels like a demanding way, to get my attention, it strikes a nerve. How does one find the patience to be a good trainer in those situations? It is not easy, but definitely necessary. Once in my apartment I was thrilled when Tarah offered a “hello” at the sight of me snacking on a piece of bread. However the enchantment wore off as Tarah began to scream anytime I was out of sight. Unaware of how to stop this undesired behavior, I did as many do, I ran back into the room each time Tarah screamed and told him to “Be quiet.” Did it work to stop the screaming? No, and at the same time I found I very much disliked my attempts at punishing reactions to the undesired behavior. I so enjoy having animals respond positively to my presence and did not want to become an unpleasant experience in my bird’s life in order to stop the screaming behavior. While in the middle of dealing with this problem, I was introduced to the book “Don’t Shoot the Dog” by Karen Pryor. (Also known as the bible of animal trainers) As I read the book, I latched onto two important principles that could help me address the screaming problem. Extinction and differential reinforcement. Extinction is described as the process of discontinuing reinforcing a behavior that has been previously reinforced. In other words part of my strategy should include discontinuing offering reinforcement for screaming. This meant I should no longer run back into the room, or yell at Tarah. The book did not describe the exact situation I was experiencing with my bird. Rather it described the principles and how to apply them to a variety of examples, human and animal. In reading the words, I made the connection that the concepts could apply to any behavior I no longer wanted to continue. Paired with the principle of extinction was the strategy of differential reinforcement of an alternate behavior. In other words, if screaming would no longer work to get a response from me, what would? For Tarah this turned out to be a whistle. In the middle of a session of screaming and me doing my best to ignore this undesired behavior, Tarah offered a “whistle”. I immediately reinforced this by responding with the word “good”. Tarah replied with a scream. This was because at this point he only had one repetition of whistling being positively reinforced and entire of year of screaming being reinforced. However I remained consistent with my strategies and within two weeks time Tarah learned to whistle instead of scream when he wanted a response from me. 17 years later Tarah whistles when he wants to know where I am, when he desires a toy or treat, when I come home, and when he simply seems to be “happy”. The undesired screaming behavior was extinguished and replaced with a whistling sound. Misty seemed to throw a kink in our now peaceful, well behaved and relatively quiet household. I “knew” from my past experience that I could repeat the process I had implemented with Tarah. However this time proved to be a bit more challenging. Because I was working out of the home at the time, it meant no breaks from dealing with the behavior problem. Every time I left the room I was challenged with having to be focused on training this bird. I was finding this to be very demanding. In addition there were times in the day when mentally I was just not prepared to train. Rather than feeling inspired to train and ready to resolve the behavior problem, I found myself dreading having to leave a room and work with Misty. I decided I needed to better set myself up for success. In getting to know Misty, who other than the screaming behavior, I found to be a delight, I learned that in the past she was accustomed to being covered at night. I took advantage of this and decided to leave Misty covered during the time in the morning I needed to shower and prepare breakfast and bird diets in the kitchen. This allowed me time to peacefully attend to necessary tasks in the morning. After this, I found I was less stressed and more prepared to begin a training session with Misty. Throughout the day I would treat each time I left the room for whatever reason as a learning opportunity for Misty. I practiced my strategy of extinguishing screaming by not responding to it, followed by reinforcing a desired behavior. In Misty’s case the desired behavior was not a specific sound. Instead I chose to reinforce silence. My plan was to reinforce small increments of time of silence and gradually increase the duration Misty was silent before I would reinforce her with my presence or attention. If I was in the kitchen I would wait just outside of her view while she screamed. At first if she offered a pause in screaming that seemed the slightest second longer than what she had presented in between screams in the past, I would quickly appear and offer generous amounts of attention. I wanted quiet to receive a greater amount of positive reinforcement than screaming if I could. Overtime I gradually increased the amount of time she remained quiet before I would respond. And it worked! However this was not without challenges. There were times throughout the day when a training session was not convenient for me when I needed to leave the room. Rather than cover Misty I opted for engaging her in other acceptable activity. For example, I often offered Misty a small cardboard box, a rolled up ball of newspaper, a new toy, or a portion of her diet just prior to leaving the room. This gave Misty another activity to focus on instead of screaming. But it also was not an opportunity for Misty to learn that screaming would not gain my attention and quiet would. It was still important to include training sessions throughout the day. The other activity was meant only to offer a break from training for me. This may have also lengthened the amount of time it took overall to teach Misty that screaming no longer would work. Another challenge in training Misty was that Tarah was in the same room as Misty. Tarah would whistle at times when I left the room. While I wanted to respond to his whistle, I did not want to also then accidentally reinforce Misty’s screaming. My strategy had to be to only reinforce Tarah’s whistle if Misty was not screaming. If I was focused on the training session, I also found I could position myself so that Tarah could see me, but Misty could not. This allowed me to reinforce Tarah’s “good” behavior and wait for Misty to offer silence before responding to her. Misty’s screaming also appeared to stimulate an occasional screaming behavior in Tarah as well. Fortunately because he had a strong reinforcement history for a whistle, I simply waited for him to offer a whistle before I would respond. Tarah quickly returned to offering a whistle and once again extinguished screaming. Misty also would on occasion scream for my attention while I was in the room. When this occurred, I simply left the room. Again my thought process was to teach her that screaming now created the opposite response. Instead of people coming to her, people go away. It was also important to reinforce her with attention at times for being quiet while I was in the room as well. Overall training misty to present silence to gain my attention took about 6 weeks to train. Obviously this was longer than it took to change Tarah's behavior. This could have been a result of the strength of the behavior in each bird based on their individual positive reinforcement histories. It could have also been a result of the fewer training sessions applied to Misty during the given amount of time. It could also be a factor of the birds as individual learners. In any case the end result was a bird that successfully learned to present desired behavior for attention as opposed to the undesired behavior of screaming. I went through the emotional gamut that many companion parrot owners face when addressing screaming problems. However by focusing on good training strategy and allowing myself opportunities to relieve myself of the stress associated with addressing the problem I was able to attain my desired training goal. Screaming for attention is a behavior problem with a solution. Set yourself up for success and invest the time to train the desired behavior. The end result can be a lifetime of good behavior. Reinforce any other behavior besides screaming. Remember the extinction burst is a good sign! The end might be insight. Change your feeling from frustrated to hopeful when your bird really goes for it. If you need to leave the room, but can’t focus on training, offer another positively reinforcing activity prior to leaving the room. This may buy you a short window of time to move freely between rooms without screaming behavior. However you will still need to include training sessions at some point. Get some earplugs to help you cope with the screaming during the extinction burst. Plan to wait in the other room. Prepare in advance a quiet activity you can do when trying to deal with a screaming session. Leave the room immediately when your bird screams for your attention. Manage your activities to help set yourself up for success. For example keep the lights off or your bird covered for a few extra minutes in the morning until you are prepared to deal with the screaming with good training strategies. Get support. If neighbors are having a problem with your screaming parrot, explain to your neighbors that you are working on training your bird not to scream. Count seconds in intervals of silence and increase if possible. Focus on fixing the problem instead of your frustration. Believe you will get there. This strategy does work. Keep notes if necessary to determine how and when this behavior maybe getting reinforced. Eliminate any reinforcement of screaming. Offer even more reinforcement for the desired behavior than the undesired behavior would normally receive in the past. I have an 11 month old sun conure and a 14 year old indian ring-neck parakeet. My conure has recently "taught" my IRN how to scream...AAHHH! My question is, the bulk of the screaming happens when I get up in the morning (I live alone) or when I come home (unless it's past "bedtime") I suppose I have reinforced this behavior by going directly to the bird room and opening cages as this has been my normal routine. I just end up feeling guilty for leaving them screaming because I work extremely irregular hours (mornings, evenings, and overnights) and don't often get the quality time that I am wanting with them, so I try make every minute count. Any suggestions? Thank you for your support to the avian world. I don't know where I would have been without you. ok so currently i'm staying with my parents for an extended period of time. my 12 year old amazon has NEVER had a screaming problem before. but my father, who has alzheimers, has reinforced all kinds of negative behavior in her. she now has an out of control screaming problem which he continues to reinforce. the second she hears my dad but doesn't see him, she screams. this he often will whistle or talk back to her. which makes her scream louder. which makes the dog bark. it's pandemonium and i work from home so it's incredibly stressful. it is not possible to involve in any of the training activities described in the article. so far, i've just tried to cover my bird the second she starts screaming, and remove the cover if she is silent, or chattering softly for more than five seconds. whenever my dad is awake and around, this screaming situation is out of hand. whenever he takes a nap or is out of the house, however, she is my normal quiet bird. any other ideas besides covering her whenever she starts screaming? Tough situation with your dad and I am sorry to hear of his struggles and yours. Couple things....Everytime someone walks into the room to cover the bird, if it is paired with the bird screaming, it actually reinforces the behavior. You would have to time your appearance for when the bird is not screaming. Another suggestion is to run a fan or radio near the room so the bird has a harder time hearing your dad in the other room. With 2 amazons in the house, there always seems to be about a 30 minute 'greeting of the sun' in the morning, where they just call back and forth. Once we come downstairs, the 'kids' quiet down and we come in for morning greetings and breakfast. When they get rowdy, we ignore them or walk out of the living room. Once they've quieted down, we peek around the corner and speak to them in a quiet manner, slowly coming to the cage whispering at them. They get all skinny and interested and whisper back and get treats. The squawkings are getting shorter-lived as time goes on, but I accept that kids will be kids and get rowdy every once in a while. I grew up with six birds in my house hold. We have two red-headed mexican amazons, two african greys, and two cockatiels. The africa greys are wonderful birds, other than they are very aggressive ever since we put a next box on their cage. They love the nest box but will not have babies. I've come to realize that they probably will not have eggs because of the stressful environment. Do you think we should take the nest box away for a couple of years and gain back the good relationship we once had with them? The red-headed mexican amazons are definitely screamers, and i know that's natural for their type of bird, although, the boy, Ricky, i know does it for attention most of the time. When i go into or leave the room he starts screaming. He has always screamed and now that i've started researching things that i can do to stop this behavior, i'm afraid to say that we've been going about this all wrong. If we start giving him treats when he is good, how long do you think it will take for him to stop screaming when i'm around or leave the room for a brief period of time? I have a Nanday Conure. He is a very sweet bird but his screaming is ear piercing. I have no backround on him as he was purchased at a bird fair and the owner was not present. His screaming is happening when I turn on water, handle a plastic bag, turn on the microwave, any kind of buzzer. At first I thought it was fear but It has been 3months and I was thinking he should be used to these noises. I show him what I am doing so he knows, but it still continues. What can I do to help him get over this thing he has for sounds? I have a 1 year old cockatiel. Starting about a week ago he began to have a screaming problem. He screams if I am in the room or not. Every 5-10 seconds he emits a piercing call and I don't know why. I live in an apartment and the neighbors do not appreciate 5-7 hours of his constant screaming call. He has food, water, his toys and when he is in the room with me he is on my desk with toys and access to his cage. I am trying your training method, but since he screams whether I am in the room or not I am not sure it is working. Please help, it has been about 5 days and I can't get him to be quiet even for an hour no matter I do. I have a 12 year old Hahn's Macaw which I have used Barbara's training methods to good success except when the bird is screaming. She loves to scream #1. When we talk on the phone, #2. When a visitor comes in the house, #3. When my husband first comes home from work and wants to talk. We live in a very small apartment and unless we want a visitor to come up to our bedroom, we cannot leave Callie screaming. We try to reinforce good sounds when it is just me and my husband but in our small place, when it involves visitors or people on the phone, it is impossible to hear the visitor speak and reinforce non-screaming behavior (if there is any). This makes our efforts to deal with #3 pitifully inadequate. Any further suggestions? I have a 5 month old sun conure, I have had him since he was 13 weeks old and he recently has started biting. He doesn't lunge at me or draw blood but as soon as he sits on my shoulder he starts nibbling and pinching on my neck, my ears and wherever he can reach. He also bites when he seems to get excited when were playing or if I try to remove him from my shoulder. His wings are not clipped and so trying to catch him to place him into his cage has turned into a chasing game. Is this normal adolecent behaviour? Is there any way I can train him to not bite when he is sitting on me or when i'm removing him from my shoulder. He rarely draws blood but it still hurts! I've tried ignoring but it is very hard, any better suggestions? Thanks. 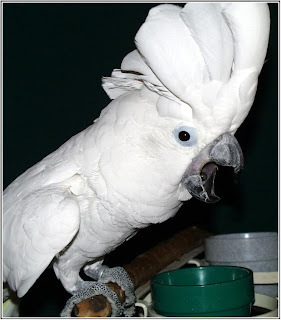 I have a 21-year-old cockatoo, Sydney, my husband and I got when we were newly married. At first all was well - a little screaming around sunset, which we attributed to natural bird behavior. But that was it. About 10 years ago, our careers went into overdrive with lots of travel and long hours. My husband, Bob, and I have been working at home for the past two years, and as long as Bob is around, Sydney's screaming in controllable. Bob just tells him "quiet" and Sydney is quiet. But the situation is changing. Bob started a new job in DC this month and I'm in the process of packing us up to move out there. But without Bob here, Sydney feels free to scream anytime I leave the room. And just to clarify - Sydney is my bird. I'm the one that pets him and cuddles with him. He'll let Bob touch him, but it's me he wants. He screams incessantly when I leave the room. I'm working on positive reinforcement and am seeing some improvement, but it is going very slow. He also HATES our little maltese, Mully, a rescue dog that is partly blind, deaf and has no teeth. Sydney goes bonkers if he sees Mully, especially if Mully is with me. He even bit off part of Mully's tail! Mully just isn't capable of understanding the danger Sydney presents to him, so I can't have them in the same room. I'm doing my best to reinforce quiet behavior and tolerant behavior of Mully, but I fear that once we move into tighter quarters in DC, the neighbors will revolt and force us to find him a new home. Any advice on "starting over" with a problem bird in a new location? Do you know of any parrot behavioral specialists in DC that I can contact for personal help and training? Also, whenever I do leave the room when Sydney starts to scream (as part of the training), our other dog, Ozzy, who Sydney gets along fine with,starts to howl along with Sydney, which I fear reinforces the screaming. I've started taking Ozzy out of the room with me in an effort to stop that cacophony, but Ozzy is quick to howl on cue - even from a distance. So do you know of anyone that can help me in the DC area? Not seeking free advice, but real help. I am going to refer you to Pamela Clark. She offers one on one consultations. She is not in DC but can work with you over the phone and internet. Her email address is clark.exotics@thegrid.net. I do highly recommend her. Keep in mind not all vocalization is about seeking attention. So therefore ignoring it is not always the appropriate choice. I cant tell from your post if that is the problem. You might have to do a bit more observation of the specific triggers and make some adjustment to the environment to address the situation. For example providing a night light or not having the two birds together at night. These are just examples however. Your observations will help identify the real triggers and solutions. My 45 year old orange winged amazon have never had a screaming problem, but since we moved into a larger apartment he screams all the time. I know he wants to be outside the cage, and it's OK, I want him to be outside the cage too! BUT, sometimes I want him in the cage - for example when we're making dinner in the kitchen, when we are going to bed for the night, and when we leave our home. In these situations, I want him to be in his cage. Sometimes he prefers being in his cage, but screams anyway. I leave the room... he screams. I am still in the room, but walk too far away from the cage... he screams. If I am saying good night to him, and turns around to leave the room... he screams. When I talk to someone else... he screams. When I wake up in the morning, and he hear me in antother room... he screams. * can't stand it anymore, gives up and walks to him and cuddle with him. * walk away from the cage when/if he starts screaming. * gives him a sunflower seed when he is talking with his normal voice. I was given a Cockatiel and the lady said he's VERY loud. ( i live in a studio apt)i brought him home and put him in a cage next to a huge cage where i already had another (very quiet) cockatiel. for about 3 weeks, He did alot of talking to my quiet one, then i let him out and the 1st thing he did was go into the quiet ones huge cage ( both males) and now the only time he yells is when i leave his eyesight, then he flies to my shoulder and quiets down. Now they both live happily together in the 6 foot tall cage. So having a 'buddy' worked for me. i live in australia and have a grey/pink male galah approx. 3 years of age. his screaming is driving me crazy to the point where i yell and scream, leave the room, or spray him with water just to get him to shut up. i cannot do anything with out him screeching, i cant leave the house without hearing him screaming half way down the street, it is to the point where i am embarassed to have visitors over because i am at my wits end. Definitely read this article and follow the methods to the letter and it will work. But you will have to stop yelling back, squirting, etc at the bird. Those actually reinforce the behavior. Read the article again for a more detailed explanation. Remember you need to stop reinforcing the undesired behavior by responding and heavily reinforce something esle that you find acceptable. 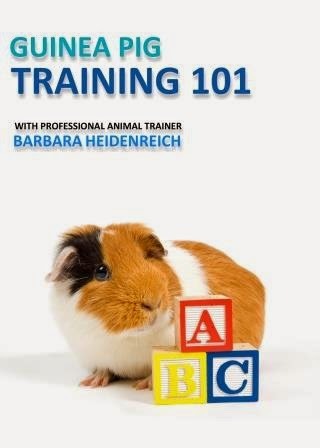 You are basicaly going to teach screaming doesnt work to get my attention, but something else does. I recently purchased a 12 yr old blue and gold macaw (Rosa) from a pet store. She was letting me touch her and was stepping up. After having her here for 6wks now she is starting where she doesnt want to step up anymore, we DID stop most of her biting problem but now she doesnt even want me to hold her. I had her wings, feet and bill taken care of a few wks after i got her and the person that did it said they knew my bird from the pet store and said they were glad that I bought Rosa because they knew she had been tormented at the pet store and not treated very well. Any suggestions on how to get her to trust me and let me hold her again? You are on the right track. Just remember to never reinforce the undesired sound and heavily reinforce accetpable sounds. You might have to really pay attention to the littlest things you do that might be reinforcing the undesired sound and eliminate those too. Dont give up! He is just doing what he thinks will work. Now teach him something else will work. My birds don't get along with each other!!! A year ago, I adopted a green cheek conure (Manolito, 18 months old)... He is very hyper and friendly... few months later, I decided to get a friend for him, another conure, a fancy pineapple (Carmelita, 16 months)... she is a little bit needy and loud but they started to get along since the beginning... Manolito welcomed her and they became very close... they share the same cage, they used to feed and pet each other all the time, take baths together, etc., at least for the past 10 months or so. Two weeks ago, I adopted another conure, Valentin (9 months), he is a sun conure, he is very shy but friendly, he is a petstore bird, he wants to be in his own cage all the time. I know maybe I shouldn't get Valentin, but I am in love with him, and since the very first moment I saw him I wanted to give him a good and loving life. OK, I am going to tell you the problems I have right now and I hope you can help me! 1. Since the very first moment Valentin got home, Carmelita was very curious and excited, she wanted to pet him right away, but he was very shy, he did like being petted, so he screamed every time she was trying to do it. 2. Manolito didn't welcome Valentin very well... He was curious but not jumpy and every single time that Manolito tried to get close to Valentin, Valentin screamed, and Manolito got scared and kind of irritated. 3. Carmelita is getting territorial with the new friend. When they are out of the cage, She doesn't let Manolito to get close to Valentin, she puff up her feathers and bites him, to scare him away. 4. Manolito is acting grumpy, every single time he has the chance, he goes and picks on Valentin, I don't know if he actually bites him, or if he is trying to pet Valentin, but Valentin screams all the time when Manolito does on of his approaches. 5. Valentin is screaming too much, he screams when he is being petted by Manolito, He screams when Carmelita is flying away from him, and then Carmelita and Manolito scream because they don't like Valentin's screams, and now the house is a nightmare. 6. Sometimes, out of the blue, they start fighting, Carmelita vs. Valentin, Manolito vs. Valentin, or Carmelita vs. Manolito. They don't bite each other but they seem very agressive, and once again, Valentin screams very loud and that is frustrating me a lot. I am very concerned about my birds, and I want them to get along with each other, no screaming and no fighting. I got one of the dvd's from a bird/tricks web page, and I started the training diet, my guys are picky eaters but they are getting there. I am spending time with all of them. Early in the morning, I take them out of their cages and I sit on my couch and I give them they favorite fruit, they eat together, and they behave good. I am doing my best to train them, but I don't know how to start, I don't know if I can train them together, or if I have to do it, one by one. Anyway, once again, thank you very much for your time and I hope you can help me. Check those out to help give you more insights. All the best! My 11 year old Eclectus had lots of behaviour issues, all of which were reinforced by our ignorance. We are slowly working through them. Screaming biting attacking. The biting and attacking me has all but stopped and he will now step up without drawing blood. The screaming as soon as I am out of his sight is still an issue. Just when I think we are winning, he will go back to screaming, we have been working on this for a couple of months and positively reinforcing his good sounds and his talking. Not sure, but perhaps I,m doing something wrong. Congrats on your progress with your ecky. Take a moment and pat yourself on the back : ) Remeber reinforcing desired sounds is half the equation. The other half is being extremely diligent that nothing your bird views as reinforcing happens when screaming or right after screaming. I wrote another article about the tiny ways we reinforce screaming and dont realize it in a recent issue of Good Bird Magazine Here is a link to the table of contents. http://www.goodbirdinc.com/toc7-3.html and here is a link to back issues http://www.goodbirdinc.com/parrot-store-magazine.html. Dont give up! You will get there with some fine tuning. I have a 30 year old YNA that was cagebound for 25 years until we rescued her 2-1/2 months ago. She is very attached to me and of course screams when I leave her view. She is on my husbands last nerve and I need to do something quick to make it stop. Is there any hope for a 30 year old bird to stop this behavior? Yes! Just follow the instructions in the blog. I have no idea how old Tarah was when I acquired her. She was already adult. And Misty was also an older bird. Keep in mind behavior is not a permanant condition. It is always under the influence of consequences. If those consequences change, then the behavior changes. So as stated in the article, stop reinforcing screaming and heavily reinforce something else that is acceptable. I have a 7 year old Green Cheek Conure. We had our first son 11 months ago and ever since he came home, our Green Cheek has been screaming non stop. Most of the time he refuses to come out of the cage and when I finally get him out and put him on my shoulder, he still screams. Do you have any suggestions? I am at a complete loss on how to stop the screaming. Hi Barbara I have a 60+year old sulphur crested cockatoo who has always been in our family but recently came to live with me. Everything is going well but he has started screaming for my attention when he is inside, I will apply your technique. Can you offer any advice on care needs of older parrots. He has an out door aviary and I bring him inside at night. also do you think older parrots can learn new words? I dont have any specific recommendations as far as training goes for an older bird other than being aware of their physical limitations and be sure to stay in touch with a good avian vet. In my experience unless they have a history of being reinforced for offering new words they tend to offer less as they get older. However if he offers any new sounds you like be sure to reinforce him. That can get you on the path of getting more vocal behaviors. He is not too old to learn. A 43 year old cockatoo i know recently learned too allow injections without restraint. pretty impressive! We have a new cockatoo to us, and though the owner says the bird was always quiet for her, she is anything but for us. Our concern isn't as much during the day, but when she screams throughout the night. The old owner says the bird would wake herself up and "Be Scared" so when she would sound off in the middle of the night she would go down, uncover the bird, coo and cluck until she calmed down. I've tried weening her from that, but she's just not letting me. She's screaming more, and for longer periods of time when I try ignoring. Any suggestions for my "Night Terrors" as I call them? Thanks so much! We recently adopted a new bird. She seems to have night terrors, where after we cover her for the evening, we have a few hours of quiet and then screaming in the middle of the night. The old owner says she would go and coo and cluck until the bird settled, cover her back up and then head back to bed. I want to wean her of this, but she has gotten worse than ever. We have had other birds, 2 of which have been cockatoos, but neither have screamed at night like this. Please help me before I lose what sanity I have left! Thanks so much! Hi Barbara! I'm so happy I found this post. I have a really big problem with my parrots. I have two white-fronted amazons. The male, Beto, is 15 years old, and the female, Paulie, is 11 years old. They both safe the same cage and get along fairly well. My problem started since I left home for college. They are left most of the day alone, and my dad is the only one that stays at home during the day. I noticed that Beto, who used to speak a few words, is not doing it anymore and both of them scream too much. Unfortunately, it occurs when my dad speaks on the phone and in the morning when he's home. The real problem is that I want to start training them out of the screaming and reinforce the whistling and singing they used to do when I was home, but my dad has been aggressive to both of them. Every time they start the screaming, he moves the cage aggressively and opens a door that isolates them from the rest of the house in order to quiet them down. He's really frustrated with their screaming, but it's going to be too challenging for me to train them if every good behavior is reinforced by me while he reinforces the screaming. Any ideas to counter act his actions? Also, I noticed Beto has been loosing too many feathers. All his chest is bare and you can't see any green feathers, just white tiny ones. What could have happened to him? I'm glad I found this page ... as I don't feel so alone! Zowie is a 16yr old sun conure ... So you know when she screams she is loud! She has always let out a call when the sun is setting ... I'm AOK with that .. And we live in a rural area - so when she sees a hawk ... she lets her flock know. But this year she has started to scream to get my attention! She did this once before about 10 yrs ago when my partner suddenly passed away. I am sure she was picking up on my anxious vibes. I ignored her then when she did it and she finally stopped. But at that time - I was not at home all day long ... so it was a bit easier for me to do this. About 7-8 months ago she has started screaming to get my attention. She is in the same room with me during the day. I work on the computer and I am having a very hard time ignoring her! At first I tried - I would get up ... go into another room. Wait for her to get quiet and come back in and give her some attention... that worked for awhile but now she is much worse and I can't keep walking away from my computer - I will never get any work done!! So ... yes I have resorted to covering her when she gets loud. I feel bad doing this ... so I end up leaving an opening for her to see out and she does get quiet. I uncover her and many times in a few minutes we are back to her screaming! I'm in a relationship now for 7 years and while sometimes she will do it with Carol ... mostly she does it just with me! If she knows I'm in the house .. she starts screaming. If I go shopping Carol says she is good! She has also been going to the bottom of the cage and tearing up the papers ... making it like a nest! She likes to hide under paper towels - and I'm happy to give them to her as she does get quiet for awhile! I know she is a she cause when she was about 2 she laid an egg. But at the time there was no nesting behavior and she never wanted anything to do with the egg! When this first started I was thinking maybe an egg ... but this has been going on for over 7 months now! Sometimes I swear she thinks I am her mate! And she loves to go into my shirt and would probably stay there all day ... but I really need to get some things done! I have a very well behaved 2 year old Blue and Gold Macaw....when we are home. Our neighbours say that when we go out, she starts screaming. She has toys of various styles (chewing, puzzle toys, foraging items). We now bring her inside when we go out and turn on the radio. We are hoping the walls reduce the noise for the neighbours. The neighbours say that things seem better but the bird will still scream albeit muffled for the neighbours now. What can I do about my screaming bird even though I am not home to hear it or modify the behaviour? It may be labor intensive at first, but if you follow the suggestions in this article it really does work. It is about being consistant. Remember when you go back to reinforcing it once in awhile you actually teach her to be more persistnt in her screaming. You are teaching her that sometimes it works, so keep doing it! 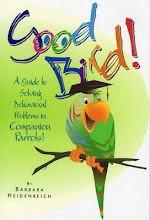 Also read the articlce on hormonal behavior in the free sample of good bird magazine. www.goodbirdmagazine.com As it does sound like you may want to address her reproductive behavior as well. Sorry if that post was confusing. The last comment was meant for Ellen. But it does apply to some of the others. I have a 7 year old Goffins cockatoo. She started running from me after I forcefully administered required oral medications to her for a week. Now she is fearful of my hands and running from me every time I try to pick her up. She steps up for other people just fine. I do not know what to do. She is a peaky eater and will not respond to a treat to come to me (I tried it many times.) What should I do? Thank you very much for all your help. We have a 12 yr old male eclectus who is very attached to my husband. He doesn't scream when we leave the room, but squawks very loudly when my husband comes in the room, or is even visible to him (he also seems to "see" him when his cage is covered, or can at least hear when my husband's in the room). His cage is in our family room, which is open to the kitchen, and I spend most of my time there when I'm home. We also have 2 other parrots in the room, though they don't spend time out together. We've thought of moving his cage to another room, but the only option is putting him upstairs in a spare bedroom where he would have very little contact with people. We've tried ignoring the squawks and only responding when he talks nicely (talking to him across the room and/or treats), but the squawking hasn't diminished. Is it possible he doesn't think there's a difference between his loud squawk and talking in a quieter voice? My husband takes him out of his cage and spends a little time with him a couple times a week, but that only keeps him quiet for about 30 minutes afterwards. I find that what most people are inadvertantly reinforcing the behavior but dont realize it. Pay very close attention to what you are doing when your bird screams. This is what is maintaining the behavior. Reinforcing it only once in a while make it more resitant to stopping. It takes a great deal of attention to detail and diligence to make sure you are not reinforcing the behavior. The "tell" that you are inadvertantly reinforcing it is that the bird is still using it to get your attention : ) Behavior that is reinforced is repeated. Your article was very helpful to me . i have a very young pink and grey galah that i have just recently brought. He is an amazing young bird. but i am having troubles stopping him from screeching . i think one of the triggers is attention but at times he just randomly does it solidly for about 10 mins . particularly at night and in the mornings. i am worried the neighbours will complain . i have brothers and my dad who tell him to shut up. i have told them to stop this but they wont listen .i guess my question is this: What could i use as positive reinforcement and what other things normally trigger a bird to screech ? Should i whistle from another room while he is screetching or just completely ignore him until he stops ? Thankyou for your help ! Check the blog again for the part about Misty and what I did when I left the room. If you have predictable times when she screams what I did with Misty will work for that. Also timing is important, dont respond when she is screaming only she makes an acceptable sound. Print out the blog for your family so they can help get on board with the strategy for solving the problem. Hello Barbara, first of all, I want to say thank you for your advice and time to answer my previous post. I have read all your books and I follow the magazine ever since. I have a particular situation, My sun conure (Valentin, 1 1/2 years) has bonded with one of my green cheeks, she is about 2 1/2 years old (carmelita), 3 months ago I decided to put them in the same cage. After a month, I saw they start mating, I know it is very uncommon and probably impossible for them to have kids, however she start laying eggs, she has laid 6 in total, my personal vet is giving her calcium and she sits on them all day long. But this is not the problem, My sun conure is screaming all the time, ever since She start laying eggs, The cage is cover so they have some privacy, but if he hears something or someone around the cage, he start screaming and sometimes it is impossible to stop him, he shows sings of stress/excitement, flapping his wings constantly, and now he is seems like he's afraid of me, he doesn't step up as often as he used to. I would love to know how I could help him to relax and if you think it is better to put him in a different cage for a while. Thanks you for your time and I hope to hear from you very soon. Hi, my name is Brandy. I have a wild caught blue front amazon that makes a particular noise that makes my skin crawl. Things that trigger the noise are; electronic toys (I have 3 small kids so they have a lot of those), the kids playing, bags, pulling a dish out, pulling a pan out, any sort of timer going off, any sound that he deems to be to loud, animals under 15 lbs especially cats, anyone talking in another room, anyone talking on the phone, anyone talking in general that he can hear, anyone eating, anyone pretending to eat, and I'm sure there's a lot more but that's all I can remember. I've tried behavior modification with treats but he hardly ever makes another noise. He does talk sometimes but he only does it after he's made that noise nonstop for over 20 min and that's when you're standing infront of him with something he really really wants. I've also tried rewarding silence but anytime I get close to his cage he makes the noise. I have no clue how to break this and I'm to the point of needing to re-home him for my sanity. He use to have free run of the house and be closed in his cage at night but now that I have small kids I don't feel it's the safest idea for the kids and him. He's also started biting. He loves my dad but he bit him so hard a few weeks ago he almost had to get stitches, he also bit my brother but not as hard. Up until then the only times he's bit was when he was around other birds his size and cats. He hates other birds and sees cats as a mate. We have had a lot of changes the past 3 years and I think it just may be to much for him to handle. I'm curious what your opinion is? Me and my boyfriend just adopted a 4 year old Senegal parrot. Never having birds before we are doing lots of research and trying to spend the same amount of time with him. In saying that, he definitely likes my boyfriend more which is totally fine until my boyfriend leaves the room and he starts screaming for his attention and if I go to him to give him attention (which I now know is not the right approach) he just backs away and screams even more. When my boyfriend is in the room he makes no noise! Although when my boyfriend isn't home at all he will obey me and want to be with me and he doesn't scream. What should we do? I volunteer at a zoo where they have a male umbrella cockatoo, which they did not have from birth. Like many cockatoos, he has loads of personality but he also has a screaming and biting issue. While the zookeepers work on training him, his handlers are highly trained volunteers who are not always there on a fixed schedule. It is difficult to set up any reinforcement program because of the variation in programs, schedules, and volunteers at the zoo. I am a new volunteer and am hoping I can build a good relationship with him starting from a blank slate. Any suggestions how to best deal with this bird in this type of situation? Thanks. I taught my oldest goffin, Boo, to "use your words" when he starts to scream. He knows he either needs to use people words or I will leave the room and ignore him. This has resulted in a very whiney cockatoo! The first 10 years of his life we lived in small apartments, and never a noise problem. We adopted Arthur who everyone said had a serious screaming problem,. He saw Boo getting attention for making people sounds, and soon learned to replace his obsessive screaming with an endless chatter of "nite nite" and his other favorite words (all "eye" sounds). After Boo (and Arthur) learned to make quieter chatter, I started only reinforcing it intermittently so that I can leave the room and they go quite long periods without pointless screaming. I think that much of this screaming and noise is also in the bird's personality. Arthur talks more often and much clearer than Boo. He also is a guard bird and likes to be where he can see everything. Boo is a forager personality, and he has quieted down a lot since we brought Arthur home 2 years ago (Arthur watches for danger while Boo forages, and they're both happier birds). The first day, they traded cages, permanently, because Arthur wanted to be in the taller cage with direct view out the side window, and Boo wanted to be in Arthur's shorter cozier cage without a window view. So, with us, it's been behavior training along with paying attention to the environment and the bird's personality to set things up for success. Thank you for your post! I will definitely try it. I have been using a different strategy so far. I taught my bird a "goodbye" word which means that I am no longer available for her. I started to use "goodbye" before sleep and when I leave home. The bird learned it and now she repeats it after me or says it when I leave the room or put her in her cage in the evening. Now I sometimes use it as a sign that I'm leaving the room and that I am will not come to the bird if she screams for me. But it doesn't work all the time. I just adopted a 5 year old indian ringneck male yesterday. He is very quiet most of the time but lets out a loud screech when I am eating or if he hears me with what sounds like a bag of goodies ie chips. I live in an apartment and don't want this to continue or even get worse. I think he wants what I have or to see me. I walk out of the room with my treats until he is quiet but any other suggestions? Did you read the article above? One of the key parts of the solution is reinforcing something else that does works. Sounds to me lke you are missing that part. I would suggest re-reading this carefully if you have not done so already. When he is being quiet I talk to him quietly and give him attention. I am still learning what he likes because we are only on day 2 together. But he also screeches when I open the bag of bird treats...do I walk away with them and return to him and treat him when he is quiet? I guess I am more questioning the timing to reinforce the good and not accidentally the bad? Yup. The undesired behavior causes the removal of the opportunity for good stuff, desired behavior causes it to appear. Pair these directly with the behaviors you are targeting. Okay great thank you he is my first bird and I want to undo bad behaviors he may have learned the 5 years he's been alive before I got him. He really is a sweetheart though. I want him and the neighbors to be happy. Thanks. I just rescued a 10 year old Goffins who is very sweet! Her one vice is she screams - at night! During the day she might scream a couple times but she stops. At night, she could scream for HOURS. No one says anything, no one yells, we completely ignore her. She goes to bed at the same night. We give her a treat and say "Goodnight Lacey" and about ten minutes after putting her to bed, she screams relentlessly until she falls asleep. We were told to cover her so she can sleep, but covering her causes her to scream for a half an hour to an hour instead of multiple hours. Is there anything we can do? We've had her two months and nothing has changed. I'm not sure if I read your message correctly. I couldn't tell if you meant the bird screamed more or less when covered. In any case, covered or uncovered which ever results in less screaming is the way to go. There is no requirement for bird to be covered at night. It really is based on the individual. You can also have a wonderful new toy or foraging activity in the cage, waiting for your bird. This gives the bird some other acceptable behavior to engage in when you walk away. If the item or activity is intriguing enough your bird is likely to focus on that instead of screaming. Jake, my Hahn's has been pretty well behaved regarding screaming since he was a year. He came to us at 5 months old with screaming reinforced. He's 5 now. He's always been a bit weird in that he likes to be on his own, he will only play with his toys, etc. if he's covered and when he was younger he'd scream until we left the room. We moved house about a month ago and we tried keeping Jake in the same room as us - I always worried about his antisocial habits. He, however was happier with his own bedroom. However since my partner has started his new job, Jake screams at 6am when he hears us getting up and will shout intermittently until about 9am, then has another shout when Chris gets home from school. Since he was a baby we've reinforced a hello to signal that we're coming to see him and a bye bye to say that we're leaving and won't be back for a little while but all that seems to have gone by the board. He still says hello when he sees us but after saying bye bye, he screams. I'm going to try following your advice. I'd like to reinforce for silence, how long do you recommend waiting while he's silent before I go in? Just a few seoonds at first. But some other things needs to be considered. Keep in mind all the sounds you make just moving around the house reinforce the behavior. You will need to behave like you disappeared into thin air whenever the undesired sound is made. I would also thimk about adding a new toy or foraging item to the cage after the bird has gone to roost. This way in the morning he has something esle to engage in when he wakes up. Best to you and your bird! Hello! and thanks you for this great post, you have been great help, I've been reading your books and know I can identify my flock's body language. I have a beautiful flock, 5 green cheeks and 2 sun conures. I have a little problem with my flock... out of the blue, my flock start screaming for attention very early in the morning (they used to be very quite until 8 o'clock), now, I have to uncover them and give them food right away otherwise the whole world will know about their wrath. I can handle a little screaming, but lately it has been increasing, and since the time changed, now they are screaming for attention and yelling at 5 o'clock in the morning, if you have any advice please HELP! my sun conures are very loud and they are driving my partner crazy and I'm afraid I' going to have problems with my neighbors. Thanks for your time. I have a 2 year old Galah named Stubby, I only recently got him. I'm very aware that he has just hit puberty in time for mating season so he is going to cause a lot of trouble for a few months. He has a lot of behavioral issues from his previous family, the two mains being his screaming when I leave the room, and the fact that he refuses to go to bed in his cage when it's time for sleep (he bites and screams bloody-murder, it takes me an hour to get him back in the cage). 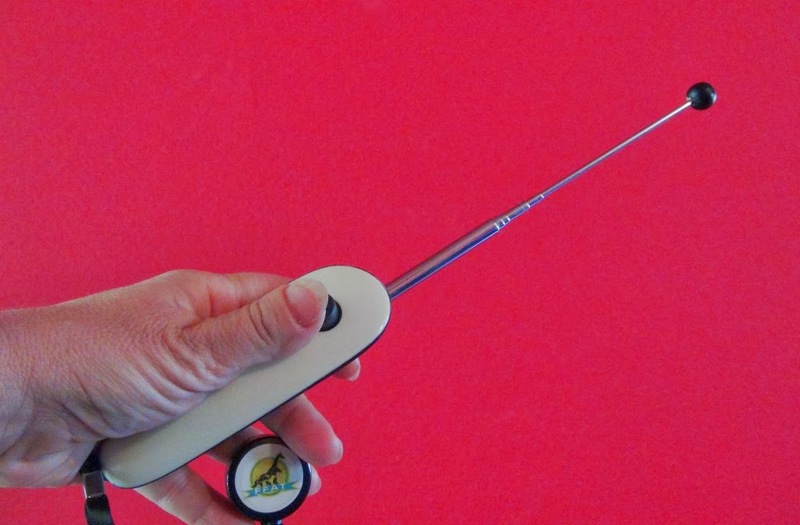 This article has helped me address his screaming issue, i'm lucky that Stubby does give up after a minute, though it is needed that he doesn't scream when i'm with him too (I have rats and his screeching hurts their little ears). I understand very much that as a Galah, Stubby MUST have at least 7-12 hours of attention a day and his breed is notoriously noisy (hence the saying "as noisy as a Galah"), but he does need to be quiet sometimes. So thank you for posting this article. Sorry to hear about the problem. Your post pretty much states why things went wrong.....you reinforce the behavior everytime you run in there and feed when they scream : ) You might take a look at this blog again and you will see the similarities....and also the solution. Hi there I recently adopted a 4 yr old eclectus and he is an overall good bird and of course we expect plenty of noise. He gets a ton of attention and there is usually someone always home. In the morning he does a few screeches even if we are around and then does a loud whistle . The whistle and the short screech is what lasts pretty much all day. He does the loud whistle usually followed by a screech even if we are close by in the living room. His perch is 6 ft away. The whistles sound like a contact call and I hear you should always just say another word whenever they screech or whistle. But he's not seeming to get it. What do you think is the best option..
Also since there is my neice and nephew in the house I don't know how "consistent" my training can be. Do you know anyone in the Orlando area who can assist in the noise behavior like you originally did with misty. Great article and the comments just reinforce your methodology. I have a slightly different screaming issue but suspect you will answer it with, "leave the room!". I have a four-month old infant with a sun and jenday conure. We moved in the last year and had a baby. These were my husband's birds. The jenday hates everyone but him and is a biter. The sun was never a biter and only would go to my husband before moving. Suddenly, after moving, I have become his object of affection. He flies to me constantly, flutters on the cage, and screams everytime I try to sit in tne living room. It is unbearable at times and the baby's naptimes are affected because of the screams. 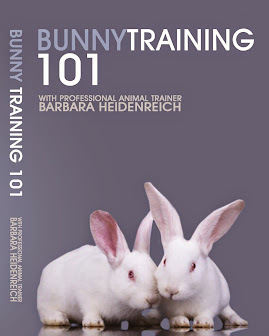 I have to implement some sort of training! I really don't want to be cooped up in my bedroom all day for weeks on end! He does get quiet when I close the door to the bedroom. It is mainly the sun....thanks for all you do for birds! I have a Pacific Green Parrotlet named Baron Von Trapp, who I've had for almost a year and a half now. He can do tricks and is generally very well behaved, however, he loves the kitchen he flies in there constantly and once in the kitchen he starts screaming! My current technique of taking him (by having him step up, not by grabbing him) back to his cage and saying "No" (not yelling) hasn't been effective at all, he still screams every time he enters the kitchen! Any suggestions? Question 2: I feel badly because he is all alone throughout the day, he fell in love with an oven mitt which I put in his cage. I want to get him a friend but I don't want to have to worry about them mating, do you think it would be OK to get him a male companion? Thank you Barbara! Barbara, please help! I have a cockatiel, Sunshine. I've had him for a couple of years now, not sure how old he is because I found him in the street. Seems he might've flew out of someone's window or they let him go. He was very frail when I found him and I could not just leave him out in the cold. My problem is such as the one described in this article. He does not stop screaming!! It drives me insane! Literally! Nothing works! It seems to me that his issue is something like separation anxiety. If I go out of sight, he starts screaming and screeching. As soon as he can see me again, he's fine. If I leave my house I can hear him from all the way outside or out the hallway. I've tried spraying water in his face and saying "quiet" when he gets like this but that doesn't really work. Sometimes I can say QUIET and he will quiet down, but not for very long. I just don't know what to do. There are times when I work from home where I have to force myself to work in the living room just so he can always see me and I could have a day of peace. I don't want to give him away, he's so affectionate, but I don't think I can live with the constant noise. What can I do?! I have a Red Fronted Macaw what squawks (loud) constantly for attention. When I leave the room and offer another positively reinforcing activity Red Fronted Macaw ignores it and continues to scream. What can I do in this case? There are 3 others in my household. Can each of us reinforce a palatable sound my RFM makes or do we need to reinforce the same sound in an attempt to extinguish the screaming? I have an Congo African Grey, Double Yellow Head Amazon and a Red Fronted Macaw. I have written you a few minutes ago but thought of another question. I notice that when my grey says certain things it triggers my RFM to scream. Any advice on how best to handle this? Please re-read the article. You will find the solution described very clearly in there. I even mention how what you are doing reinforces the behavior. Definitely read it again. I attended one of your seminars. My military macaw was previously kept in a university lab where students would come and go all day, sometimes teasing him. He was left alone for the weekends. He learned to scream for attention. He was very nervous and insecure.I used your methods and first identified the triggers. I decided to reinforce silence and provide daily play and interaction to build trust and security. I only came in the room when he was quiet and left if he was screaming. I entered and whispered "is there a quiet bird??" and gave him a treat. If he screamed I left. If he would vocalize hello which was acceptable I reinforced by reply hello from another room. This became his contact call with me. These strategies worked. It took about a year. He is now a loving and secure bird with acceptable vocalizations. He will occasionally belt out a a good scream, but it is bearable because it is in the range of normal parrot behavior that I can live with. I have a Sun Conure and a Nanday Conure, the Nanday doesn't scream that much but my Sun Conure won't stop! It screams mainly when people are in the room or when it can hear anyone, every time we are on the phone, in the morning, at night, when someone is over or even if we are out the front of the entire house! My family get angry and ask me to quieten it down as it is really shrill so i do what I'm not supposed to and give it attention which I'm sure is just feeding the problem more but sometimes it is the only thing that will allow them some brief normality in their daily life. Iv even had to on occasions cover the cage to quieten it down in the day time too which i hate doing. It gets heaps of attention and time out of its cage everyday at certain times and is on a great variety diet and has as many enrichment toys as it could want but i just don't know what to do? Any ideas? I really need some advice as to how i could curve the behaviour as its getting worse and there is no way i want to give up. I have 2 grey African parrots, age around 2 and 3.
they scream in such a bad way. I'm feeling very nervous of it specially that my neighbors complained to the company responsible for the apartment and we said we'll try to handle this, otherwise they won't allow us to have pets anymore. the problem is, I tried everything desperately with no hope. The female specially is so hyper active and really has a very loud voice oppsite to the male. - I tried rewarding them when silence. - I tried to walk ut of the room and close the door when they make noise. and once they are silent for a moment a come in again and reward them with a toy or fruits or anything they love. - I tried punishing them by covering their cage. - tried to give them as shower to calm with no hope. noting that they sleeps enough in a calm room and covered. really I'm desperate now and was looking for someone to take them as I can't handle anymore. I can't do anything in my life anymore because of them! ANY HELP?!! OR JUST NO HOPE?! I've read a lot of your work and need some advice. We recently rescued an umbrella cockatoo - Fred - knowing that he came from a severely abusive home, then spent two years with a woman who got him to stop plucking, and she had to give him up when her grandson had to come to live with her (so we are his third home). He and I have developed a good relationship with a lot of effort (and a lot of your advice! ), but he HATES my husband - he screams whenever he hears his voice, will fly and/or charge at him, attacks and sometimes bites him. Fred can be playing in his cage or on his playstand, and as soon as he hears my husband's car in the driveway, his heavy footsteps, or his voice, he becomes very agitated and screams incessantly - and if he forgets to take off the baseball hat before he comes in the house, heaven help us! I love Fred dearly, but he's passed his screaming habit on to our other parrots and everyone is becoming increasingly exhausted and frustrated with the noise. With the nice weather, we've discovered that he also likes to scream at any man he sees walking down the street in front of the house, and he's extra loud if the windows are open and he hears a man! I'm afraid someone is going to call the cops for the noise one day! Any suggestions on how we can ameliorate this situation? Hi I have a four and a half year old Ekky called Charlie. His screaming is non stop and I have tried to ignore his behaviour and only respond to words or calls that are wanted with treats and attention. It has been months and it is still not working. He has been checked over at the vet and everything. He has play toys and foraging toys so he isn't bored while I am at work and seems to only scream on the weekend when everyone is home. He hates the sound of a two stroke anything (mower ect) but screams regardless! This causes so much stress on my family because we simply do not know what to do anymore. I have watched all your dvds. Have tried training and watching his behaviour I have ignored him (and so has the rest of the family) but we are at breaking point.. please help. Is there anything else we can do? I don't actually have a parrot (don't ask me how I ended up on this corner of the internet)but I found this fascinating to read, it sounds totally unbearable! But these are all very good tips. I really appreciate this blog post. I just brought home a rescue Umbrella Cockatoo named Kuna. Not sure how old he is. He's a sweetie, as U2s tend to be, but HOLY GUACAMOLE can that bird scream. I've had birds for going on 16 years, but never have I had a bird with such a scream. We have an exchange student coming to live with us at the end of August, so my goal is to have this problem beat by then. Our house is small enough that you can't really escape a screaming Cockatoo. Keeping my fingers crossed. Hi I'm thinking of getting a Cockatiel soon and reading this, I was wondering if he'd start screaming and hoping he or she won't. So I guess what I'm asking is how do you -prevent- screaming from ever occurring? Dont reinforce a sound you dont like in the first place :) And reinforce a different sound you like. That will avoid getting into that situation. We recently brought home a young sun conure. She's amazing little rascal, in two days knows how to step up. She plays and loves the toys I am providing her (has 3 toys + 5 handmade foraging) and can go all day playing. Getting bored in the late afternoon, seeking for attention directly by climbing to us. However, when we leave the house/room whe cries out to us (I suppose she is calling us - her flock - back) and stops all the activities. Just screaming and jumping on the bars calling and calling and calling. We are trying to ignore it, responding to only "cute" tweeting, and praising her when she plays, but it tears my heart thinking she keeps crying for us all the time we are away at work ... Must not be healthy even for her. She seems absolutely content playing "alone" just as long as somebody is in the room. We decided to inform her, when leaving for a short time (another room) saying "Be right back!" and wait for her to offer a cute tweet or prolonged silence before returning. And saying "Bye bye!" when going away for a longer period, greeting her "Hello!" as soon as we get into the house (even when she is still screaming, it takes her a few minutes to calm down). I just wonder if we are on the "right" track. She is with us just a few days, so we are hoping for .. quieter .. future. Will she learn that we are not permanently leaving her but going to return to love her as soon as work for us ends? I also tried to offer her a toy before leaving, but she just drops it and starts the "don't leave me alone" cry. Here are a few additional tips and info to help you. First I am fairly confident the screaming stops as soon as she realizes you are truly gone. If you want to check, try putting a webcam on her that you can check from work. Second a toy is clearly not special enough of an item to offer before your leave. I would go for a super favorite treat, like a whole nut in the shell, or a bigger piece of a favroite food. I would also teach her that being calm as you are leaving results in this extra special goodie. This means practicing it at a time when you dont really need to leave. Start walking a little towards the door and if she is calm, say good and walk offer and offer the nut. Overtime you gradually work up to going out the door, but then coming back in if she is quiet and offering the treat. Eventually you will sometimes walk out and not come back...but I would always deliver that special treat before leabing for calm behavior. If you are still having problems with Screaming for Attention I have put together a very comprehensive webinar on the topic. You can find a recording of it here http://www.goodbirdinc.com/goodbirdinc.com/parrot-store-digital.html If the problem is unresolved it is usually about the application of the information. The webinar goes into great detail on the mistakes often made that lead to getting stuck. Thanks Barbara. Your method worked for me and my 15 year old African Grey. I came home last night and announced to her and my dog that we were going to try a new method (instead of time outs). It sure caught my bird's attention when I ignored her ear-piercing scream (ear plugs help)! By the end of the evening, it became clear to me that she really needed some "Mom time" to play games and cuddle, and also that she was jealous of my dog. I guess I have been pretty busy with work and chores lately. This morning she tested me a couple times and I continued to ignore the bad and respond to the good. Overall, it was a great evening and morning. Best we've had in several months! Hi I have a Mollucan Cockatoo. She screams when My husband start to talk or the phone rings and I start to talk. She screams when if we try to watch tv. Basically all the time unless she is center of attention. Help me I've tried leaving the room and returning and praising her. She just starts again. Hi Karen, I have a very comprehensive webinar recording that goes through the steps in detail on how to address this problem and why it is happening in the first place. You can find it here. https://vimeo.com/ondemand/screamingparrot It will help you get on track. 2 hours worth of detailed expert information. We are losing our minds! I have a 8yr old double yellow male Amazon. He is a very good bird however he is constantly saying bye-bye all day and night long. He doesn't swear or scream and knows tons of words and songs. He has toys, a TV, 7 cats, and a 1yr old great Pyrenees to play with. We cover him at night and now during the day. I feel horrible bout this. We even resorted to squirting him with a water sprayer, but then he laughs and sticks his chest out. I praise him when he says anything else Please help with this phrase. 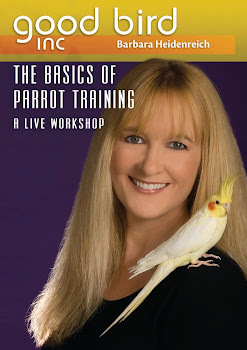 I highly recommend you listen to the webinar recording here https://vimeo.com/ondemand/screamingparrot It is very comprehensive and will help you get on track. You are missing small details that are causing you to not succeed in your approach. This webinar is two hours of material. Much better than I can give you here. I think this just saved my sanity and my family's. We have an around 15 yr old male grey cockatiel named Rogue that came to us, he was a stray, long story. The week after we "adopted" him, we had to go out of town for my brother's wedding. When we got back, the bird had developed separation anxiety and was screaming a lot. Now he still does it and has developed a strong attachment to me, so I can't even leave the room without him screaming. My mom needs near 24 hour care, so unfortunately I don't have as much time to take Rogue out as I used to. Google has had little on the subject, so I ewas so glad I found this!! A million and one thank yous! I will work on the whistling and training and see what works best.